On that day, we were busy in observing water birds with our binox in a reservoir of dam site within Balaram-Ambaji Wildlife Sanctuary. Suddenly a bird with glossy red bill crosses the road, literally by walking-not flying exactly in front of us. We both speak in unison… “Oh it is Sirkeer Malkoha!” It disappears swiftly through vegetation running like mongoose. We were little bit depressed because no one’s camera ready at that moment. We missed one more chance to photograph beauty of ‘Lipstick bird’. We tried to find it for some time then decided to move ahead. While returning we stopped by at same place to look out just in case…! We got luckier this time. 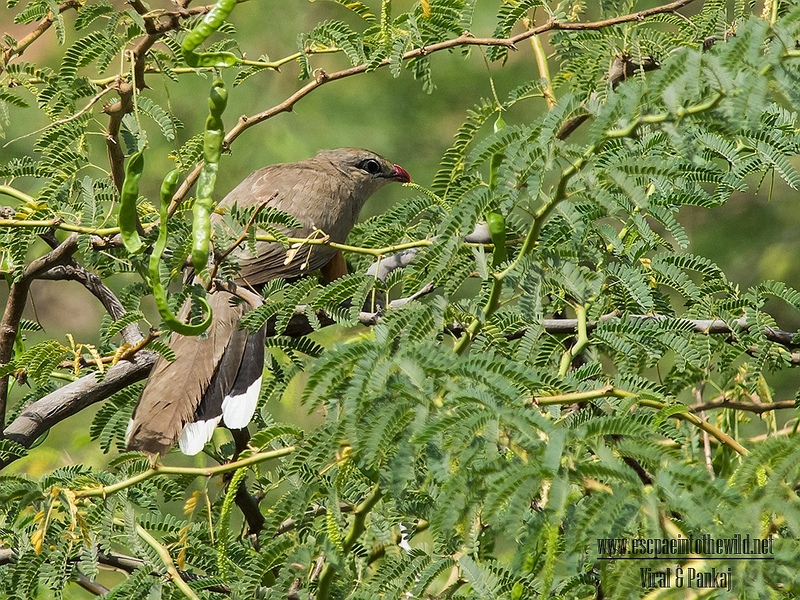 We were able to spot well-concealed Sirkeer Malkoha on one of the Prosopis juliflora (ગાંડો બાવળ) shrub only because it was calling…! It has very attractive hooked bill with bright cherry-red and yellow color. It is a large bird around 40 cm. mainly brown and rufous in colour and having long heavy white tipped tail feathers. It was hopping from branch to branch with great agility, like the coucal. We saw this bird many times but first time we got somewhat clear shots. The sirkeer malkoha or sirkeer cuckoo (Phaenicophaeus leschenaultii), is a member of the cuckoo order of birds, the Cuculiformes. It is a resident bird in the Indian subcontinent. The scientific name of this bird honors the French botanist and ornithologist Jean Baptiste Leschenault de la Tour. Their habitat is largely terrestrial, open scrub and thorn jungle, deciduous secondary jungle. Normally seen singly or in pairs. Sexes are similar, but juveniles are duller and barred above. Usually stalks amongst thickets like crow-pheasant, searching for food; insects, lizards, fallen fruits and berries, etc. They prefer to runs swiftly through undergrowth rather than fly. They are feeble flier, but climb trees rapidly. Their call is normally a subdued "bzuk... bzuk" ; also an alarm call of "p'tang" with a metallic quality.